Last week’s analysis of FTSE expected more upwards movement to end about 6,695.25. Price moved higher as expected reaching 6,708.17, 12.92 points above the target. I expect this correction is over and the downwards trend should resume. I am expecting to see an increase in downwards momentum over the next week towards 6,258. This target may be one to two weeks away. 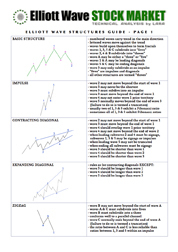 Click on the chart below to enlarge. 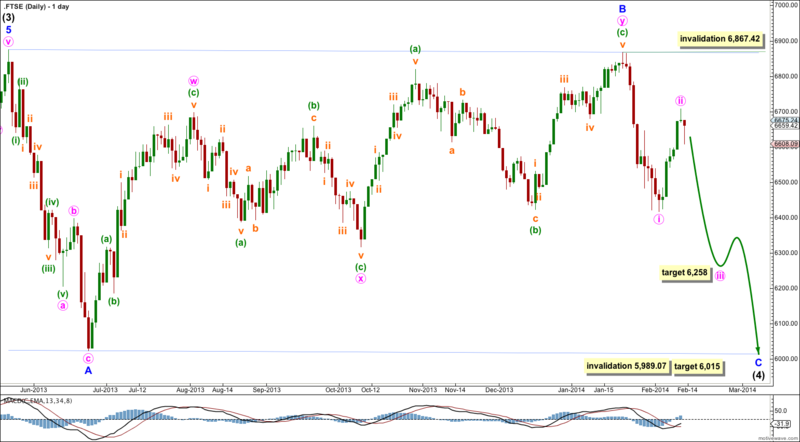 Intermediate wave (4) may be completing as a regular flat correction which is reasonably common. Within the flat minor waves A and B both subdivide as “threes”: minor wave A is a single zigzag and minor wave B is a double zigzag. Minor wave B is a 99% correction of minor wave A. At 6,015 minor wave C would reach equality in length with minor wave A. It is very likely to make a new low below the end of minor wave A at 6,023.44 to avoid a truncation, although if it is truncated this would still be a regular flat and not a running flat. 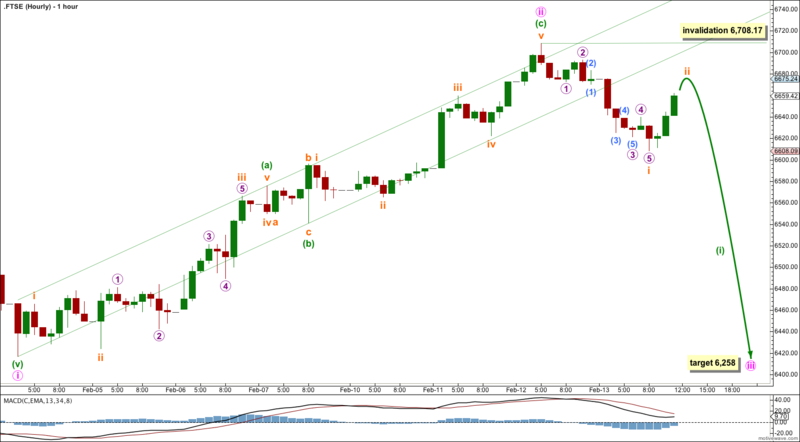 Minor wave C may end at the lower edge of the parallel channel drawn about this flat correction. Intermediate wave (4) may not move into intermediate wave (1) price territory. This wave count is invalidated with movement below 5,989.07. Minor wave C downwards must subdivide as a five wave structure, either a simple impulse or an ending diagonal. Within it the first wave labeled minute wave i subdivides best on the hourly chart as an impulse, and so minor wave C is most likely to be an impulse. An ending diagonal would require the first wave to subdivide as a zigzag. Minute wave ii is now likely to be complete ending just above the 0.618 Fibonacci ratio of minute wave i. If minute wave ii is incomplete and extends further then it may not move beyond the start of minute wave i. This wave count is invalidated at minor degree with movement above 6,867.42. Within minute wave ii the structure is a nicely completed three wave zigzag. Minuette wave (c) is 8.2 points longer than equality with minuette wave (a). The channel drawn about this zigzag is clearly breached by downwards movement indicating a resumption of the downwards trend. The downwards movement subdivides perfectly as a five wave impulse, with an extended third wave. This is further indication that minute wave ii is most likely over and minute wave iii has most likely begun. At 6,258 minute wave iii would reach equality in length with minute wave i. 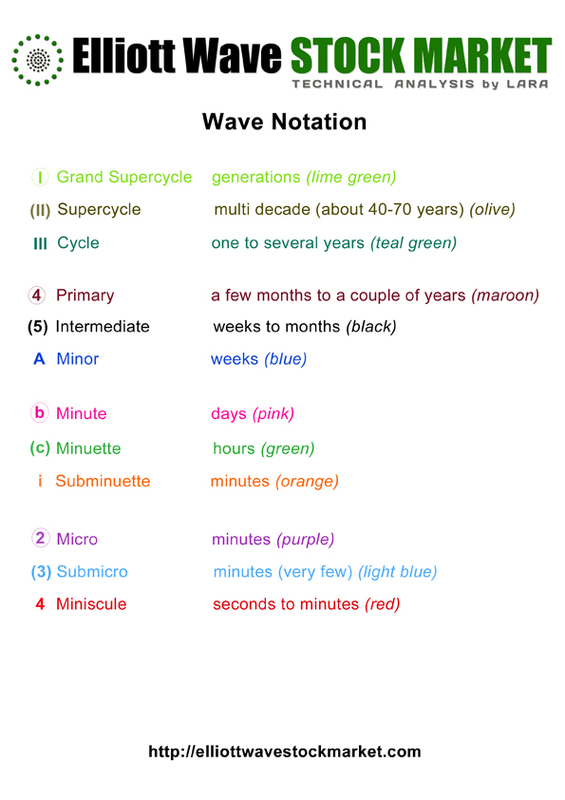 Within minute wave iii subminuette wave ii may not move beyond the start of subminuette wave i. This wave count is invalidated at minute degree with movement above 6,708.17. Let’s see if that works… hopefully you will all be able to communicate with each other in real time now and not wait for me. No worries. I’m trying to figure out how I can stop Disqus from putting everything in moderation by default. I’d like members and readers to be able to engage in discussion, and waiting for me to moderate comments stops that. If anyone reading this knows how to do this in Disqus please let me know. I didn’t delete it, it was waiting in moderation. I went surfing today for a few hours. When there are waves I surf. Apologies, then. Have a nice weekend. Yes. If my wave count is invalidated (which is looking somewhat likely) then it looks like a new upwards trend. I suspect it may be completing a barrier triangle. I’ll try to get that published this weekend. Huh? How come you removed my comment? I’m just wondering what your view on the FTSE is now… I liked and agreed with your current count. Hmm, the FTSE looks to be misbehaving, doesn’t it?